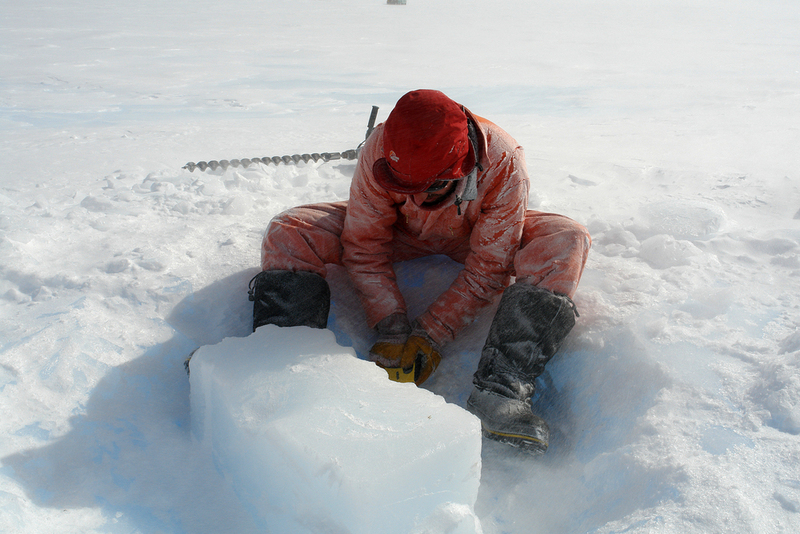 In 2006/07 Anne Brodie was awarded an Antarctic international fellowship sponsored by the British Antarctic Survey (BAS) and the Arts Council. She spent nearly 3 months living and working in the Antarctic at the BAS base Rothera and re-fuelling depot Sky Blue. A diary of her experience was published weekly as the first ‘Artists talking’ online for a.n Artists Information Company, and can be read here - a.n blog. The beginning of the 'Wastegloo'. 'Visiting Antarctica is something very few people have the opportunity of experiencing. The way in which most people have access to its environment is through the media and historical archives of photographs and artifacts from past explorations. It is portrayed as a land of beauty, danger, challenges and other worldliness. In Antarctica’s vast uncluttered spaces, the light shines more brightly, the dark is darker, and sounds intensified. The ecology and genetics form distinct and separate ecosystems from the rest of the world. Things show up clearer here. The edges appear crisp. It’s easy to think of Antarctica as being separate and nothing to do with the rest of us, as beautiful and as inaccessible as the moon. But Antarctica is very much part of our world; interacting with, influencing and reflecting the world around us. It also has something else less measurable and less definable, something that people who live and work in its environment or even visit briefly, experience. When stripped of the superfluous external stimuli that surround our normal everyday lives, we become more aware of our own vulnerabilities and human significance. We light up; we leave noticeable traces, we become aware of our own edges. Living and working at the scientific research stations requires a strong interdependency between people, the role of the air mechanic, chef, or research scientist all equally vital to the community. The significance of our interactions with each other and our environment are heightened. Our actions have direct consequences on those around us and we take more care. Through the mediums of hot glass (using a glass furnace that she constructed on site), film, sound and photography, Brodie responded to the Antarctic as a dynamic, ever-moving part of a fragile balanced system, and its interaction with the visiting human population.